In September, the world’s weapons industry plans to arrive in London for a huge arms fair: Defence & Security Equipment International (DSEI). The results of DSEI are felt around the world as people are killed, economies are devastated, refugees are traumatised and peaceful protest is crushed. War starts here: Despite Israel’s brutal attacks on Gaza last summer which Save the Children described as a “war on children”, it will host a pavilion at the arms fair to market its “battle-tested” weapons. Repression starts here: Despite UK-made weaponry being used to suppress protests in Bahrain, the country’s brutal rulers were among 14 authoritarian regimes invited by the UK government to shop for weapons at DSEI 2013. Environmental destruction starts here: Governments routinely put military spending before tackling climate change. The UK spends 25 times more on weapons research than research into renewable energy. Because it starts here, we can stop it here. We can stand in the way of the arms fair’s business and its devastating impact around the world. Exhibition equipment and military hardware will be rolling (or sailing) into ExCeL – let’s stop it getting to its destination. Come to a workshop or talk to find out more or invite a speaker or host a film-showing where you are! Expose and challenge the arms fair exhibitors near you. 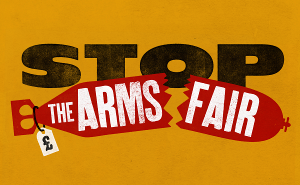 Call on the civilian firms which make the arms fair possible to stop enabling the arms trade. Take part in a big day of action on Saturday 12th September and a week of action from 7th September to stop the arms fair from even getting started. Join the Facebook event for the week of action and invite others to do so too! Keep an eye on our exciting events list for more action and training and the arms fair approaches! Order flyers to help spread the word: please let us know your name, address, how many you’d like and when/where you plan to use them! Get involved with helping make it all happen: come along to the next Stop the Arms Fair meeting, which will be on Wednesday 5 August, 6pm, at the CAAT Office in Finsbury Park. Surely that just means it has to make more, better, more radical and dangerous things to stay one step ahead? Bit like paper, stone scissors? I am struggling to find honest, unbiased evidence of what exactly is going on. I’m horrified as I’m finding just how devious and unethical the government is already to people who are part of what makes Britain Great in the first place. Please can you send me further information? Unfortunately the UK sells a lot of weapons to other countries. According to the Stockholm International Peace Research Institute (SIPRI) the UK is currently the fourth largest arms exporter in the world, behind only the US, Russia and France. There is even a government department (UKTI DSO) staffed with over 100 civil servants whose only job is to push arms sales to other countries. There’s lots more information on the website of Campaign Against Arms Trade (CAAT). I recommend starting with their Introduction to the Arms Trade. If you want to follow the campaign, you can sign up to their mailing list, and there are lots of ways to get involved.